Be very careful about eating dried fruits. A lot of fruits become tart when they are dried so the manufacturers often add sugar. Read the labels! 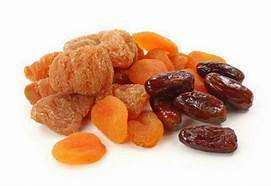 And remember those smaller pieces of dried fruit were once regular size pieces and they still contain most of the same nutrients. That means there are not less carbs in dried fruits just because they are smaller! Be sure you buy unsweetened varieties and never eat more than 2 tablespoons per serving.